The goal of this adventure was to leverage the SharePoint blog site template and SharePoint Social Rating capabilities to construct an ideation type of site. But alas, this was one of those things that took me an ungodly amount of time to try and figure out a solution for… hopefully this post will be able to help others solve the same problem. Yes, there are lots of blog posts out there that show how we can add the rating capabilities to individual blog post entries, but I couldn’t find one that described the process for adding the rating stars to the homepage of the blog site template’s summary view web part for each of the posts. With some help with the MSDN SharePoint Forums and a fellow by the name of Raghavendra Shanbhag, we figured it out with the steps outlined below. 1. Assuming that your blog site has been created, turn on ratings for your Posts Document Library as described here. 2. Download this custom blog.xsl file and upload it to a Style Library or any other Document Library of your choice. Note at around line 121 is where we added the AverageRating field to the output which is the only customization that was performed on the original XSL. 3. 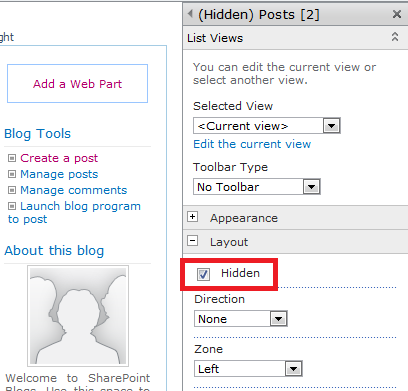 Open the blog site homepage and edit it in SharePoint Designer. Here, you’ll want to click on the Posts web part and add the Rating (0-5) column for the field to be displayed in the view. 4. While you’re in SharePoint Designer, you can also include a link to the custom XSL that you had uploaded in Step 2. Henry, this is awesome. Would you mind posting a screen shot or two of what the end result looks like? Hey Sherman, thanks for the suggestion. I just added a small screen shot of what the posting looks like with the rating stars to the end of the post. once i save – after adding link to the custom xsl file. Error: Reference to undeclared namespace prefix: ‘xsl’. Thanks for posting this, Henry. I walk through the star rating add to the individual posts in my forthcoming book (Implementing Real-World Solutions in SharePoint 2010, MS Press Feb2012), and am now going to point to this post for an additional solution. You’re very welcome Christian. Can’t wait to see how your book turns out! Tried to implement your solution today. It works well on the default.aspx (blog overview), however I couldn’t get it to work on the detail view (Post.aspx?ID=3). The stars are displayed correctly, but there is no functionality to them. Means I can only rate items on the overview page, which is kinda half-baked. Any suggestion? I too implemented the solution. the rating started appearing in the default page and but could not have the functionality of rating the post there instead i need to rate them at the library where all post are located. lex, i didnt get the start rating in post.aspx page , did you made any extra changes to get it there? I am also facing same error , Any Luck ? i have tried this and this logic working only for 1 post, if there is any other post rating coming for first post is coming for second post too, Have you faced this ? I can see the star rating in default.aspx but how do i see it in post.aspx page , where i see a single blog post? i did the same for post.aspx page as well but it is not woking. I learned a lot along the way of implimenting this solution, But the functionality is not working. It shows the results, but it is not interactive. Have you found a solution? Brilliant idea to automatically register the scripts. Wish I’d thought of it! Great job. The second Post webpart needs to be in a different webpart zone for this to work. Awesome article. Thank you very much Henry!!! Great article! it worked for me, thanks a lot!! One question though, if I click one of the categories, the rating doesn’t show there, and I don’t seem to be able to apply the same approach because the category pages are not static pages, also the Posts web part doesn’t allow me to edit the current view in order to add rating column. Does anyone know how to achieve this? Thanks. works like a charm….thank you so much for this wonderful blog. 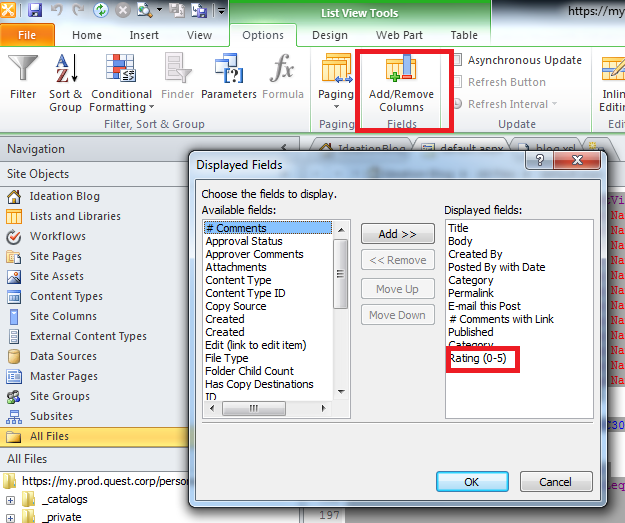 Hi Henry, how do you customise this in SharePoint 2013? In the SharePoint Designer 2013 it does not have the Add/Remove column button, is there a way to modify the source in the default.aspx ?